Lydia Layne McLean-Butler was born in Cambridge, Massachusetts on April 13th, 1921 to Zaccheus and Louise Layne. She graduated from Houghton Elementary School and Cambridge High and Latin High School. While in the eighth grade she made a dress and then decided she wanted a matching hat. Having no pattern, Lydia used a dinner plate to cut out a wearable tam with material to match her dress. That success went to her head and fortunately to hundreds of other heads over the years!! Lydia went on to New York which she entered the Traphagen School of Fashion majoring in Millinery Design. Lydia became the 1st African American to attend and graduate the Traphagen School in 1943. Lydia was quickly hired by Matty’s Exclusive Creations, a specialty shop located on 55th St and Park Avenue in New York City where she became known as the top designer. One of her hats received highest honors in an Easter show at the Savoy Ballroom. Her mother’s fatal illness caused Lydia to return home to Cambridge in 1948. During this period she made the acquaintance of Milton “Jack” Mclean Sr. whom she married in 1950. They had one child, Milton “Mike” McLean Jr. They divorced in 1973. Her first Boston fashion showing was in 1949. Every year since 1949 through the late 1980s Lydia has presented her one-woman show continually expanding it into a large-scale production with six to eight hundred people attending. She was the first designer in the Boston area to feature male models. In 1961 Lydia came up with the concept to have a Hat queen not based on beauty or talent, which she considered overdone. Lydia decided on a popularity contest with the winner to be chosen on the basis of the greatest number of tickets sold to her hat show. Each ticket sold would be considered one vote. This way, youth, beauty or talent, would not be a factor for becoming her Hat Queen. 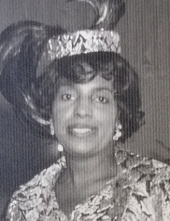 The Hat Queen received Hats, and numerous gifts from sponsors like British Airways, Pepsi Cola, Segrams, and Anheuser Busch Inc.
For her longevity and charitable accomplishments, Lydia has received numerous Citations from The Massachusetts State Senate, The Massachusetts House of Representatives, The Mayor of the City of Cambridge, and The Cambridge City Council. In 1962 Lydia was awarded the Samuel Mason Gold Thimble in New York City for exhibiting creative and outstanding ability in the fashion world. Lydia was also pictured and cited in Ebony Magazine in May of 1950. Lydia also taught millinery at the Medford Community Center. In 1994, while in her mid-seventies Lydia moved to San Antonio, Texas to be closer to her son & grandsons, but continued creating and designing hats well into her nineties. Lydia married William Butler in 1997 while residing in San Antonio. Lydia is survived by her only Son “Mike” Milton D. McLean Jr. (Dahlia), stepdaughter Wanda Short (Ricardo) of Sterling Va, grandsons Joshua McLean, Milton David McLean III, & Jason McLean, nephews, Gregory, & Tony Layne, Nieces; Marquerita Jackson, Ellen Ford, Catherine Manson, great nieces Monique, Collete & Tracy; cousins, Bob, Ronnie & Yvette Layne, Yvonne Blackmon, Clyde Grant, Gladys & Teddy Layne, Clifford Layne, Melaine Hall, Edna Tolliver, and a host of other cousins and friends residing throughout the United States who are not listed. Lydia is preceded in death by her Father Zaccheus Layne; Mother Louise Noak Layne; brother Paul Layne, Nephew Paul Layne Jr. (Bunny) and sisters Esther Fisher, Marion Layne and William Butler. Visitation is Friday April 19, 2019 at 10:00 AM and chapel service at 11:00 AM to 12:30 PM. Graveside service is Monday 10:30 AM April 22, 2019 at Ft. Sam Houston National Cemetery. To send flowers or a remembrance gift to the family of Lydia McLean-Butler, please visit our Tribute Store. Guaranteed delivery before Lydia's graveside begins. "Email Address" would like to share the life celebration of Lydia McLean-Butler. Click on the "link" to go to share a favorite memory or leave a condolence message for the family.